New Connections via Disqus. But Only If You Want To. 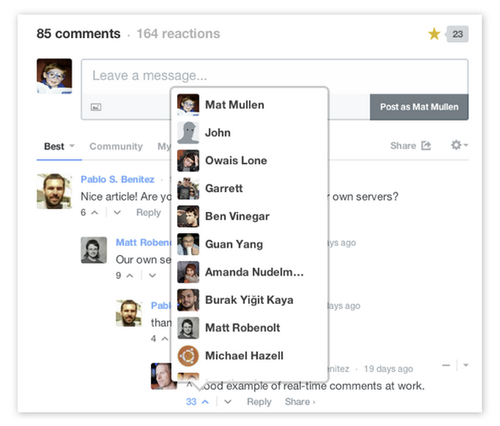 One of the great things about Disqus is the diversity of conversations, sites and people across our network. On any given day, there are 120 million people connecting to Disqus to be part of discussions covering all topics imaginable. Increasingly, people are finding new stuff to talk about by connecting with other commenters. So over the past year, we’ve been building ways that make it easier for you to find and follow people on Disqus who may help you discover new communities. In the last couple of months, we released improvements to profiles, My Disqus and digest emails to make it easier to discover new discussions across Disqus. With the continued goal of helping you discover interesting content, we’re making it even easier to find and follow interesting Disqus users on your favorite communities. Today, we’re announcing the public release of three new features: upvoting visibility, finding Disqus friends on Facebook and private activity. Did you know that people vote more than 80 million times every month on Disqus? An upvote is a quick way to show someone that you liked what they had to say. Now, you can find out who has upvoted comments by hovering your mouse over the upvote arrow. If you’re interested in finding out a little more about a user who has upvoted a comment then you can easily click on their avatar to show their full profile. Follow them if you’re interested in discovering some of their favorite communities. You already have the ability to use Disqus by logging in with your Facebook login. 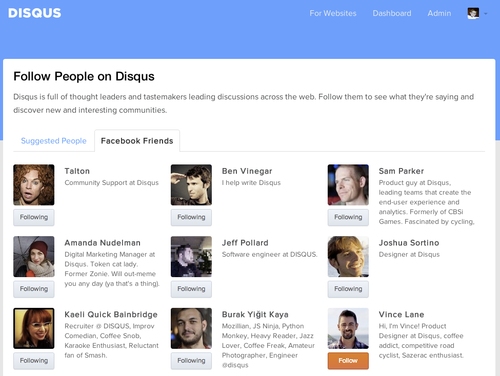 Now we’ve made it as easy to follow your Facebook friends on Disqus. You can add this to your Disqus account by connecting to Facebook. 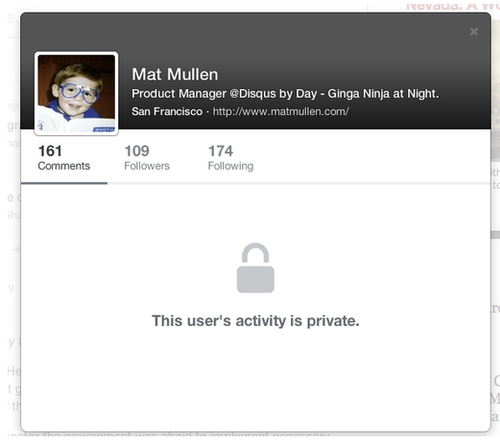 We’re also happy to announce that starting today, you can choose to keep your comment activity private. Your activity will still be public to anyone on the site where you left them, but your activity through your profile or other activity feeds will not be public. People who are currently following your account will no longer be able to see your activity via your profile or daily digest emails. People will no longer be able to follow your account. The number of existing followers will still appear in your profile stats, but they will not be able to view your activity. Please visit our FAQ for more information or questions about this new feature.